James Charlton has produced a ringing indictment of disability oppression, which, he says, is rooted in degradation, dependency, and powerlessness and is experienced in some form by five hundred million persons throughout the world who have physical, sensory, cognitive, or developmental disabilities. 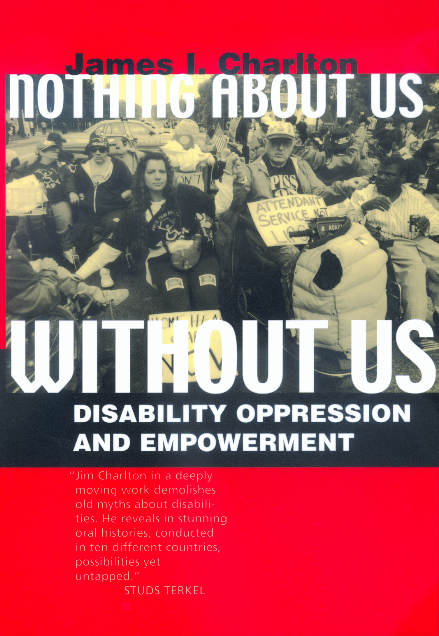 Nothing About Us Without Us is the first book in the literature on disability to provide a theoretical overview of disability oppression that shows its similarities to, and differences from, racism, sexism, and colonialism. Charlton's analysis is illuminated by interviews he conducted over a ten-year period with disability rights activists throughout the Third World, Europe, and the United States. Charlton finds an antidote for dependency and powerlessness in the resistance to disability oppression that is emerging worldwide. His interviews contain striking stories of self-reliance and empowerment evoking the new consciousness of disability rights activists. As a latecomer among the world's liberation movements, the disability rights movement will gain visibility and momentum from Charlton's elucidation of its history and its political philosophy of self-determination, which is captured in the title of his book. Nothing About Us Without Us expresses the conviction of people with disabilities that they know what is best for them. Charlton's combination of personal involvement and theoretical awareness assures greater understanding of the disability rights movement. James I. Charlton, Executive Vice President of Access Living in Chicago, is a frequent lecturer in the United States and abroad on many aspects of disability and the disability rights movement.